While softscaping (landscaping with living materials) is our bread and butter here at C&L Landscape, we also enjoy providing hardscaping services to both residential and commercial customers in the Jacksonville area. What is hardscaping you ask? It’s the art and science of landscaping with inanimate materials, like wood, concrete, brick pavers, rock and stone. If you’ve been looking to give your landscaping a fresh update, we hope you’ll take a moment to learn more about the hardscaping services we provide. Keep reading to learn some of our most creative ideas for using brick pavers, stones, and other hardscaping materials to increase the curb appeal and functionality of your property! Why Use Brick Pavers & Landscaping Stones? 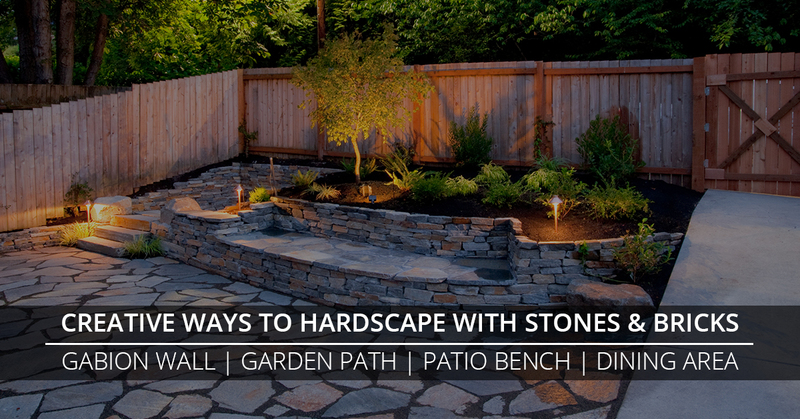 We realize that hardscaping opportunities vary from property to property. It may be that your homeowner’s association restricts the way that you can use brick pavers and stones in your yard, or that you’re a business owner who doesn’t have much extra space for landscaping improvements. However, if you’re looking for a way to give your property a facelift without creating new maintenance chores for yourself, brick pavers and stone should be at the top of your list. Not only does hardscaping add value to your property, it’s cost effective, requires low or no maintenance, and may increase your living space by transforming an outdoor place into a space you want to spend time! Gabion Wall – This is one of the trendiest new ways to incorporate stones into your landscaping, and we think it is a beautiful alternative to traditional brick or concrete walls. A gabion wall is built by creating a cage-like structure that is then filled with stones to form a wall, bench, or other type of structure. Garden Path – Are you destroying your grass by walking across your backyard to water the garden? Instead of a dirty, worn footpath, why not hire C&L Landscape to create a permanent garden path using brick pavers? This will help you to avoid stepping on hidden sticks and stones when walking across your yard, while also decreasing the square footage that you have to mow! Stone Patio Bench – Brick pavers and other types of stones can also be stacked to build lovely outdoor benches and seating areas. If you have an outdoor fireplace, a stone bench would be the perfect way to complete the space and encourage people to spend time around the fire. Outdoor Dining Area – Speaking of spending time outside, why not let us show you how easy it can be to create an outdoor dining area with the help of brick pavers? Instead of trying to eat off of a wobbly card table set up in the middle of the yard, our patio design experts will level off an area, covering it with beautiful brick pavers that show where the turf ends and the dining area begins. See our past patio designs HERE. Want to learn more about how easy and rewarding it is to hardscape with brick pavers and landscaping stones? Contact C&L Landscape in Jacksonville today!